Have you ever wondered what Jesus had in common with Horus, Attis, Krishna and Mythra? Did you ever ponder why dinosaurs never found their way to the Ark? Why God always needs more money? 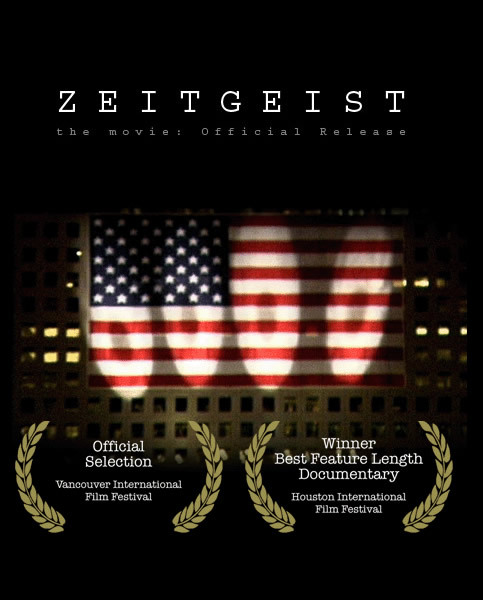 Part 1 of Zeitgeist the Movie, a 2007 documentary film produced by Peter Joseph, delves into the character of Jesus Christ, comparing his attributes, as described in the Bible to the attributes of other prophets/deities of the pre-christian (pagan) era. Quite „surprisingly“, these are to be found identical, being metaphores for astrological phenomena, such as equinoxes and solstices. The movie constantly draws from one’s Well of Paranoia (yes, we all have one). Based on the presentation of arguments and facts, it is not difficult to believe that Catholic Church (as an organization) is running it’s own show, armed with a Book written by Romans three hundred years after Christ’s demise. Christianity is considered a „spiritual fraud“ on mankind, and religion in general a „slavery“. In general, it is used as a tool to control societies and generate cash. Part 2 introduces the so-called „9/11 Myth“ which works on the premise that 9/11 was an insider job. In other words, 9/11 was organized by hidden elements in the US Government in order to pursue their own agenda, which is to boost US defense industry and, more importantly, start-up the never ending War on Terror which will ensure constant cash inflows for the interested parties. Evidence presented is once again cohesive, well-structured and persuasive. This topic is perhaps the closest to the observer of all presented conspiracy theories – it works with the well-known and still recent events that have significantly affected the Western civilization. Part 3 elaborates on the „International Bankers“ conspiracy. This thesis explains that the Federal Reserve Bank is about as federal as Federal Express. In fact, it is controlled by a consortium of banking families, including none other (lo and behold!) than the Rothschilds, Morgans and Warburgs. This would mean that monetary policy of the United States of America (which includes control over interest rates as well as money supply) is in the private hands of a privileged group of men (and, perhaps, also women). These „men behind the curtain“, as they are called, are according to Zeitgeist responsible for all major military conflicts engaging USA in the twenieth century – once again, to generate cash-flows. I can definitely say I enjoyed watching every minute of this movie. It is not presented in the form of a paranoid babble – rather, logic, arguments and evidence is used to persuade the spectator. This movie must tap the Well of Paranoia of even the most sceptical viewers amongst us. This entry was posted in Documentaries, film review, Media, Must see!!! and tagged 9/11, conspiracy theory, international bankers, religion, rfid chip, war on terrorism, zeitgeist. Bookmark the permalink.